This listing is for a wholesale lot of three (3) full (upper and lower) gasket set for 1992-98 Harley Big Twin models with the Evolution/Evo 1340cc engine. P/N (3) TEBTSBSIL/TEF + (3 sets) BTEBK2 (3 sets). 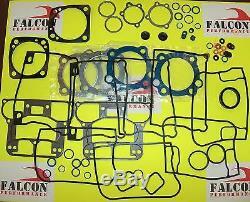 Each gasket set contains (2) Teflon and (2) silicon OE-thickness and OE-bore head gaskets; a total of (4) head gaskets. This set also includes rocker box rubbers to fit early and late Big Twin Evos. We are happy to sell these in larger quantities to chopper and bike shops around the world. Feel free to contact our professional sales team toll-free (within USA & Canada) at 800.756.1114 or (outside USA & Canada) at 601.693.8282, EXT. Thank you for looking at our listing and look forward to doing business! Thank you, the Falcon Team. 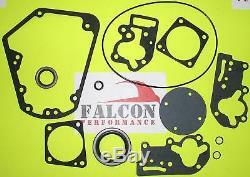 The item "Harley Evo 1340 Big Twin Full Gasket Kit withTeflon Head 92-98 Dealer LOT/3" is in sale since Wednesday, May 15, 2013. This item is in the category "eBay Motors\Parts & Accessories\Motorcycle Parts\Engines & Engine Parts\Other Engines & Engine Parts".